The High Court on Thursday observed that the National River Conservation Commission (NRCC) and the National Human Rights Commission (NHRC) appear to be ‘dummy commissions’ as they cannot take any action against offenders except placing recommendations. 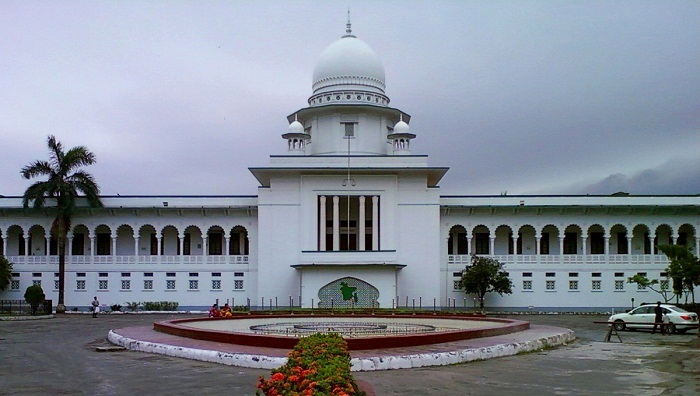 The HC bench of Justice Moyeenul Islam Chowdhury and Justice Md Ashraful Kamal came up with the observation while hearing a rule over a writ filed seeking its directives to dismantle illegal establishments and evict illegal grabbers from the banks of the Turag River. The court was scheduled to deliver the rest of its verdict on Thursday after Wednesday’s partial announcement. The court, however, said it will issue guidelines on Sunday after receiving a report on the activities of the commission. In the partial judgment, the High Court declared the Turag River as a legal/juristic person or a living being to save the river from illegal encroachment. At the beginning of the proceedings on Thursday, the court, pointing at writ petitioner Manzill Morshed, said illegal establishments are being built grabbing rivers illegally and separate cases are filed and there come separate verdicts. “Following High Court order, the administration removes illegal establishments which stage a comeback with a few days. Thus, the issue of reclaiming the rivers remains in the dark,” it said. At the point, the court asked the petitioner to file a report on the activities of the commissions, saying they will issue some guidelines on Sunday after reviewing the reply. On November 7, 2016, Human Rights and Peace for Bangladesh filed a writ following a report published on an English newspaper on grabbers’ feast on the Turag River. Later, the High Court directed the government to take steps to reclaim the river within 48 hours and also issued a rule. Later on January 5, 2017, Bangladesh Inland Water Transport Authority (BIWTA) submitted a report on their actions to save the river. On October 11, 2017, the chief judicial magistrate of Gazipur submitted a report before the HC, saying 30 structures were set up illegally along the banks of the river in the Gazipur part. On December 13, 2017, the HC directed the authorities concerned to demolish the structures immediately. As several institutions filed an appeal with the Appellate Division against the HC order, the apex court on January 14, 2018 stayed the HC order and asked it to dispose of the rule. Then, the HC bench started hearing on the rule.